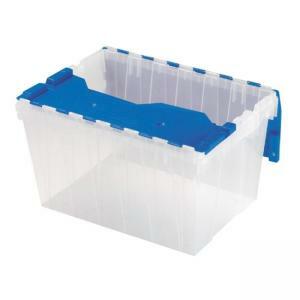 Keep Box is ideal for all household storage needs. Clear bottom allows instant identification of contents. Lids are attached with full-length steel hinge pins for durability. Secure the interlocking lid with wire tie or padlock (both sold separately) by using the hole in the edge of the lid directly above one of the handles and a corresponding hole in the storage box. Ergonomic handles make carrying easy, even under a full load. Unique rib design prevents jamming when nested on store shelves. Nesting feature makes it easy to safely store any household item inside the Keep Box and take up less storage space.